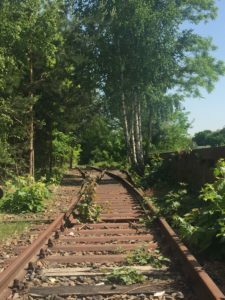 As I stood on the platforms of Grunewald Station: Track 17, located on the outskirts of Berlin, Germany, I tried to deeply grasp the feeling of what it would be like as the trains pulled up. I tried to imagine boarding on a path to the unknown. Thousands of Jewish families were taken from their homes. Perhaps in the moments of confusion and distraught, they still found ways to try and see the light at the end of this long tunnel they were about to enter. As I stood on the grounds of the horror camps of Auschwitz I and Auschwitz II-Birkenau, I tried to imagine the thought process that was going through all the minds of the Jewish citizens, the Roma and Sinti, people with disabilities and homosexuals as well as many other victims that were removed from society and imprisoned in similar concentration and death camps. I realized it was a fear that could never be felt no matter how hard I tried and a nightmare, which was a reality that could never be relived. The connection I put together from both places through my experience has made my visits to these sites something I will always deeply remember. Image A- Grunewald Station: Track 17. The memorial site of Track 17 has been established along the preserved tracks and boarding docks where thousands of Jewish citizens from all over Berlin were taken and stood waiting to board the trains to transport them to ghettos, concentration camps and death sites in Eastern Europe. Families carried suitcases filled with clothing, sentimental belongings and photographs that they couldn’t leave behind. They were told they were being relocated and were forced to purchase their own train tickets; children were free. 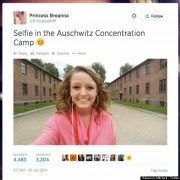 Through this process, many Jews remained hopeful that they were being relocated to serve better lives after all the dehumanization they were going through from the Nuremberg Laws. Many citizens didn’t make it to the next location because the conditions in the train carriages were horrific and crammed in as many people per cab, leaving very minimum space. Track 17 is a hidden World War II memorial, and not many people know it even exists. Opened in 1998, many German citizens still don’t know it exists and it attracts very few tourists. 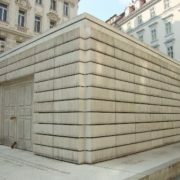 Prior to visiting this site, I didn’t know a lot about it’s significance of it and what its purpose was. When I started walking on the boarding dock, instant chills went down my spin, as I came to understand that something eerie took place here. My group was lucky enough to have a wonderful guide, Josefine, to come along with us to the site to help interpret the objective and importance of this memorial. After I let the meaning of this site settle, I started imagining how it must have felt standing there with my family, with a few belongings and not knowing where I was going. I captured a photo of the train tracks branching off in two different directions and put in plain words it was the path to the unknown. 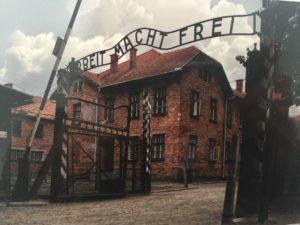 My experience at Auschwitz I and Auschwitz II-Birkenau will deeply be remembered. 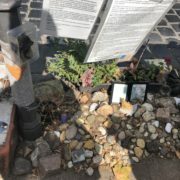 The sense of immediacy at being at sites tied to the actual events and people murdered in the Holocaust made a greater impact on me than visits to other memorials commemorating events of those times. The eerie feeling came back as I walked on the ground where millions entered, suffered and either survived or didn’t make it out alive. It made it too surreal. At Auschwitz I, the barracks were turned into exhibits to walk through, which were once bunkers for the prisoners. Mug shots of the prisoners were hanging on the walls, belongings were collected and put behind glass windows and the art children drew on the walls of their bunks were displayed in almost the order of a story being told. The one exhibit that deeply moved me emotionally was this room where home belonging to wish families were shown. 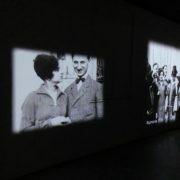 It showed you clips of what their life was like before they were taken away. Children were laughing and playing, couples were dancing and singing, groups were playing musical instruments as crowds danced and elders were smiling and hugging many of their loved ones. It showed you that they were regular human beings; they could do everything a human could do to show they were alive and enjoying life. These were the people who were steadily stripped of their human rights until they couldn’t do almost anything. 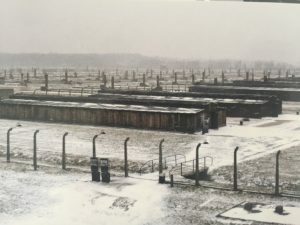 When we arrived at Auschwitz II-Birkenau, I skimmed the layout of the camp, taking in how enormous it was and how it was bigger than what I imagined it to be. 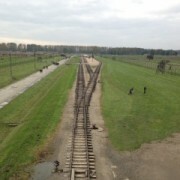 Viewing the tracks entering the camp that somewhere connected to Track 17, gave a hopeless ending to where millions of innocent people would end up. We walked through the barracks where inmates lived and slept during their imprisonment. The barracks were damp, run down and minimum space was available for the amount of people held in each one. I noticed in some of the bunks there were drawings engraved into the walls. Many of the walls had visitor’s graffiti covering them, which made me wonder how much of the barracks and other buildings in the camp were still in their original state compared to what was renovated or recently vandalized. 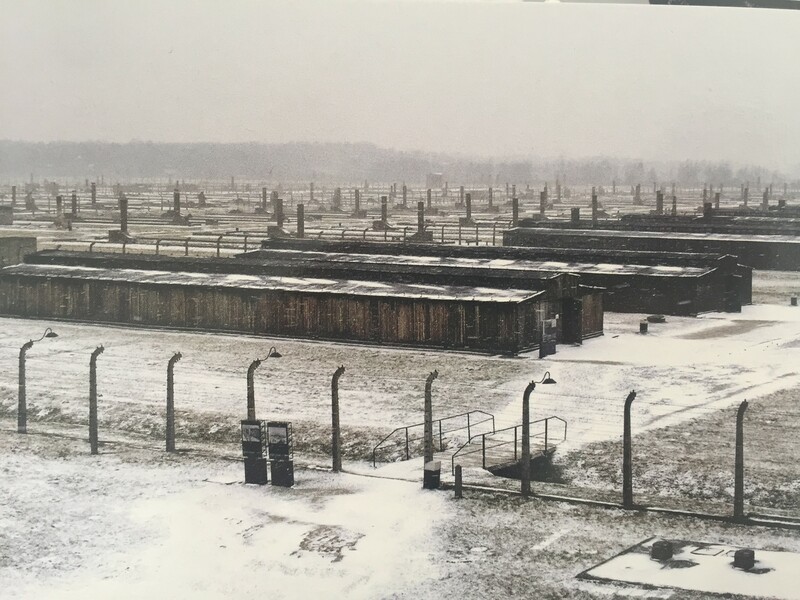 After the liberation of the camps in 1945, the majority of the barracks were torn down and destroyed along with the gas chambers and crematoriums, which was an act to hide the evidence of what took place. But you could still see the outlines of where these structures once all stood. We walked to the registration building where the those fortunate Jews who made it through the selection were processed into the camp system by stripping them of every last bit of themselves to become a prisoner worker. 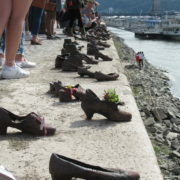 They were given a registration number that was followed by taking a shower, getting their hair cut or shaved all off and given a camp uniform and wooden clogs to wear. 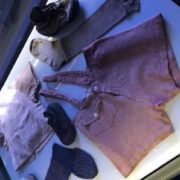 At Auschwitz I, a huge display of all hair scraps have collected and another display showed camp uniforms and clogs that were worn. Walking through the registration building blew my mind contemplating how much organization and the level of efficiency that went into running these camps. Did anybody have a sense of mind that what they were doing was wrong? 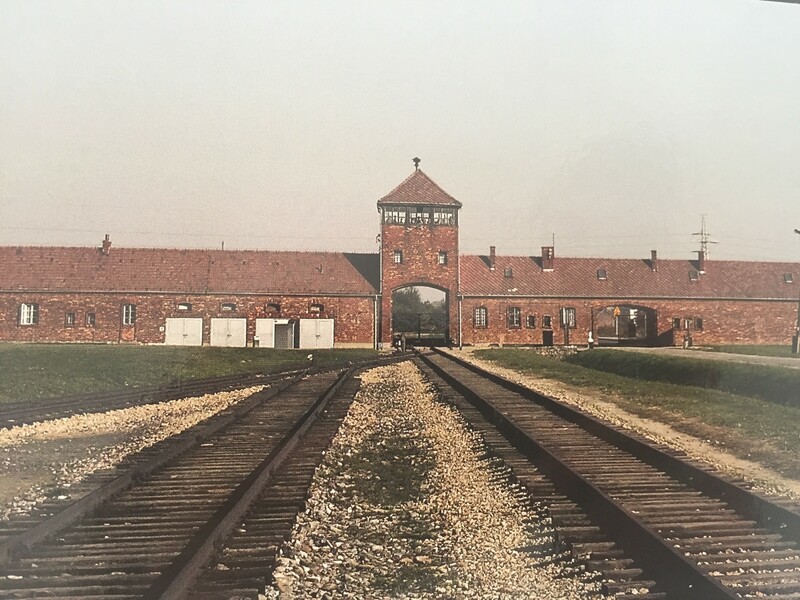 The whole topic of the Holocaust has always fascinated me, but being able to stand on the grounds of where this horrible mass killing took place opens up a personal level of awe and devastation. Many of the reasons why I wanted to study abroad was to expand my knowledge of WWII and to learn more about it from a different vantage point offered by being in a different country. I grew up with my grandfather telling many stories about what he remembered and experienced at this time and also his time serving during WWII. His stories could never put you to sleep and always added to my interest of this topic. Being able to have the opportunity to visit these memorials based off of WWII events in remembering all the victims has shown me you can make peace with the past but it will never be forgotten. It can never be covered up no matter how hard you try. 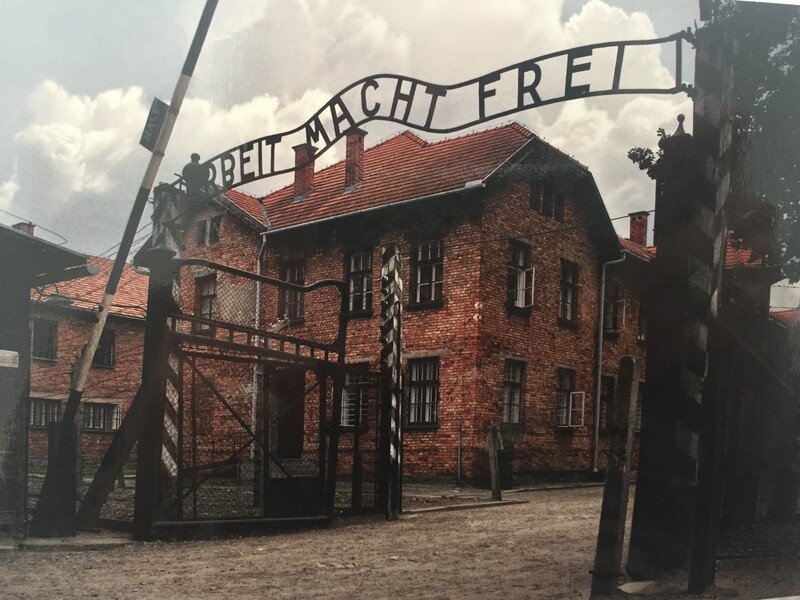 Overall, the experience I had at both camps has sharpened my knowledge and views of the Holocaust. I will always reflect back on how I was given this opportunity and how it made me feel.